Harry sold the Swiss short. They produced more than the cuckoo clock. They produced wealth and riches, more than he ever dreamed of selling his stolen and diluted penicillin. But before we get into that, it’s time to talk murder. Murder in wartime. Is that an oxymoron? In the midst of industrial-scale warfare, is there room for the almost quaint notion of murder? The illegal taking of life pales in comparison to the grand legal slaughter going on at the same time, especially during the Second World War. Certainly, everyday crime and criminality continued during the war, although the American Historical Association published a study showing a decline in the rate of major crimes committed in the United States. The theory proposed is that the absence of large numbers of young men drafted into the service, combined with increased earnings potential for those left behind, contributed to a lower rate of violent crime. However, theft, related to black market activities, flourished. But murder takes many forms. Surrounded by belligerent nations on all sides, Switzerland adopted a policy of neutrality during World War II, and worked diligently to stem to flow of refugees from Nazi Germany looking for a safe haven. The German passport marked with a red “J” for Jewish holders may be a familiar image for those familiar with the persecution endured by Jewish citizens of Germany. But few know that the distinctive red letter was placed there at the request of the Swiss government, to make it easier for them to identify Jewish refugees at the border. It’s estimated that a minimum of 24,000 Jews were turned away at the Swiss border during the war. This includes those who were discovered within Switzerland after being smuggled across the border, evading both German and Swiss guards. These unfortunate people were often charged for the cost of transporting them to the border crossing, where they were turned over to the Nazi authorities. Such is murder in wartime. In 1942, the Swiss closed their border to all but escaped POWs, deserters, and political refugees. Persecuted Jews were defined as a non-political group, and denied entry upon those grounds. During the entire war, Switzerland granted official asylum to only 252 political refugees. As a result of international pressure, Switzerland relented slightly in 1942 and allowed for hardship exceptions. These included children under sixteen and traveling alone; parents traveling with children younger than six; pregnant women and adults older than sixty-five. How any people in these categories were expected to travel across occupied Europe and cross the Swiss border while evading military patrols, was never explained. By the end of the war, there were about 60,000 civilian refugees in Switzerland. Of these, about 27,000 were Jews. The small existing Jewish population of Switzerland was taxed to pay for the cost of caring for their co-religionists, and fees were levied upon some of the wealthier foreign Jews who managed to bring cash or jewels with them. No other refugee group was assessed in the same manner. Now, back to Harry Lime. If he’d only known, he would have been in awe of the gold laundering scam run by Swiss bankers. In 1939, Germany had a legitimate gold reserve worth a little under $100 million. By 1945, they had traded over $400 million in gold to Switzerland and over $300 million to other nations. Where did all this gold come from? The Hague Land Warfare Convention of 1907 stated that public property may be confiscated by a conquering nation, but not private property. Most banks holding gold in Europe were private. This was a problem for the Nazis. Not that they cared about the legalities, but because other nations did not want to appear to be profiting from looted gold. So Swiss bankers set up a nice triangle scam for them. German trucks bearing stolen gold would cross into Switzerland, and the gold deposited in underground vaults. German purchasing agents then sold the gold to the banks for Swiss francs. Then, a deal would be made with a neutral nation; Portugal, for example, had stocks of tungsten and wolfram that were needed for the Nazi war machine. They would sell these materials to Germany in exchange for Swiss francs, which they would then promptly use to buy the gold in the Swiss banks. The banks took a nice percentage for their work, the Portuguese got laundered gold, and the Germans obtained the raw materials to wage war. The Swiss National Bank itself aided the Germans by melting down looted gold from Holland, and re-stamping the ingots with Swiss stamps to disguise their origin. All in the name of profit. The stolen gold did not only come from private banks, although a good deal was taken from private sources. Thirty-nine tons were taken from private Dutch citizens alone. A vast but unknowable quantity was taken from concentration camp victims. Gold wedding rings, dental fillings, and jewelry were all taken and melted down to be added to the German gold reserves. Much of it ended up in the bank vaults under the Bundesplatz in Bern, Switzerland. Where much of it may still remain. So I tell my story of murder in wartime in the upcoming Billy Boyle novel The Devouring, number twelve in the series. It’s 1944, and Billy and his partner Kaz are sent to Switzerland to work with OSS chief Allan Foster Dulles and protect a secret operation aimed at securing Nazi gold and preventing its use by Nazi bigwigs to escape justice at the end of the war. What they find is a nest of Gestapo killers, pro-Nazi Swiss police, bankers, and politicians, as well as threats from unforeseen quarters. The idea for this novel came after I ran across a fascinating book—The Fate of Others, by Nancy Lefenfeld, which documents the activities of a brave band of youthful Jewish resisters who went underground in occupied France and worked to smuggle young Jewish children across the Swiss border to safety. I am in awe of the bravery showed by such young people, and at such a cost. It is worth a read, and a remembrance. 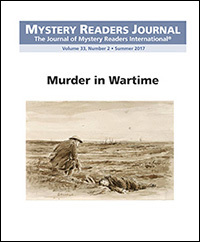 James R. Benn is the Dilys and Barry award nominated author of the popular Billy Boyle WWII mystery series, and two stand-alone books. The 12th novel in the Billy Boyle series, The Devouring, will be released 9/12/17. He and his wife Deborah Mandel divide their time between the Gulf Coast of Florida and Connecticut. I am fast asleep and suddenly my mother is shaking me awake. “Come on. Get up. Bombers. Hurry.” And I scramble to get out of bed, into some clothes while my mother shakes my brother awake. We all hurry downstairs. I can hear the wail of the warning siren; and the drone of bombers. The brick air raid shelter has been built in our back garden and we share it with our neighbours, Mr and Mrs Swann. Mr Swann is one of the few men I know who is not a soldier. He was been exempt because of flat feet. He’s a nice man who works on the buses but my mother despises him. My own father is fighting on the front line. I hardly know him. He went off to war when I was only two years old and when he does return on leave, he is a bad tempered stranger. Edgy, quick to anger, but demanding his children love him anyway. My brother, who is older, does seem to love him, so he is soon established as the favourite child. The shelter is entered by way of a narrow passageway and Mr Swann is already there. He is in the Home Guard and he is in uniform with his tin helmet. A long rifle at the ready. There are two Swann children and they are inside the shelter stretched out on the hard bunks. The tiny space is lit by candles. Very soon, the noise of bombs exploding grows louder. Mrs Swann is terrified of these nighttime air raids and we have to have a potty ready for her as fear loosens her bowels. She goes into the passage which is considered more private. It is but it also means she can see what’s going on in the night sky. That makes her even more afraid. We children scoff to ourselves at the dreadful stink she creates. Finally we hear the ‘all clear’ siren and we can leave. Perhaps we have been in there for hours, it is hard to keep track. But when we do emerge, my mother always says, ‘thank god the house is still there.’ We are unscathed, although later my brother and I go out on the streets to survey the damage to other houses. The front of one is sheered off and the bathtub teeters precariously on the edge of the floor. It is rather like an insane rendition of a doll’s house that you can open up and see the living quarters within. I knew that at some point I would have to write about my experience growing up in wartime England, but I waited a long time. With such carnage and destruction, it seemed impossible to garner interest in the often mundane existence of a typical police officer. However, after seven books in the William Murdoch series, set in placid Victorian Toronto, I felt ready to tackle a new series. Season of Darkness is set in rural Shropshire in the year 1940, the beginning of a long bloody war. Once I’d started to research the background material, I of course discovered I knew nothing. As I had lived through much of the war, I blithely thought I knew a lot. Not true. For one thing, I had no idea that in 1940, right after Dunkirk, the government and population at large, went through a dreadful time of fear. It was expected that Hitler could invade the country at any moment. As a result, all so-called “enemy aliens”, both men and women, were swept up and interned in camps that were scattered around the country. Lo and behold, one such camp was at Prees Heath, barely half an hour from Ludlow, where my husband and I stay every year. The camp was there for one summer and it was tented, occupied by about 1200 men. Most of them were Jewish who had fled Nazi Germany to save their lives. They were hardly likely to side with any invader. However, reason was not uppermost during that fear-soaked summer, and anyone of German or Italian origin had to be interned until things were sorted out. Prees Heath is common ground, which means that according to a centuries-old charter, it belongs to the people and nobody can build on it or occupy it in any way. I’ve always found it very important, whenever possible, to be in the same location as I’m setting my books. So off we went, two school chums, my husband and I. It was a pleasant English summer afternoon, and as I stood there, I knew that essentially what I saw was what those men had seen all those years ago. Dainty blue butterflies darted among the gorse and rough grasses. It was lovely and peaceful. However, no crime novel can remain peaceful for too long, so soon my new detective, Tom Tyler, has to investigate a strange homicide. And pertinent to the story, there are Land Girls, which I always wanted to be when I was a child. They always looked as if they were having such a jolly sunshiny time. Good propaganda on the part of the government. Very different from the harsh realities of farm life. Given my early experiences, I felt I had to return to the city of Birmingham where I had grown up. The second book, Beware This Boy, is set there in a munitions factory. When I emigrated to Canada as a teenager, I wanted nothing more than to leave a place that I saw as dreary and dull. Again, as I researched the background for the book, I ended up gaining great respect and affection for the city of my childhood, which had suffered so terribly during the war years. Another thing I didn’t really know. The next two books in this series take place a little later, but I kept the setting of Shropshire, as I have come to know it better than the grimy urban streets of Birmingham. No Known Grave is about a rehabilitation hospital where severely maimed and disfigured victims of war are recuperating. This story came out of another instance of discovery. My friend now lives in a little village called Church Stretton, and it turned out that a rehabilitation hospital had been on the hill at the edge of the village. Like many such hospitals it had originally been a grand house that was commandeered for the duration. Very unusual for the time, the surgeon realized that their emotional health was as vital as their physical health, and he asked the villagers to take the men to their hearts and homes. He begged them not to run away from these young men with their hideous faces. The response was powerful and it undoubtedly did help many of the victims to survive. A rope was strung from the hospital grounds down the hill to the village so that those men who had been blinded could have some measure of independence and walk on their own to the few shops of main street. For the purposes of my story, I used author’s privilege and moved the hospital to Ludlow. Finally, in book four, Dead Ground in Between, I was able to incorporate the true story of treasure that was discovered recently in one of the fields not too far from where my chums live. I was introduced to Howard, a retired engineer whose hobby is combing the local fields with his metal detector, in search of buried treasure. In 2011 he found a pot which contained 137 silver and gold coins, all dating from the time of the English Civil War. ‘Nobody knows why they were buried in that field,’ said the archeologist. Ha! What sort of challenge is that to a mystery writer? I soon came up with a very plausible explanation. I was happy to realize as the books unfolded that DCI Tom Tyler’s job did seem significant and important even against that dreadful wartime backdrop. And all things seep in from the war and affect everything that happens. Since completing the fourth book, I have moved back to detective William Murdoch but have moved ahead in time to 1917. WWI time. I have learned such a lot here as well. But that is another story. Maureen Jennings has written fourteen novels. The first seven are set in Victorian Toronto and have been adapted for television. Murdoch Mysteries is now in its eleventh season. The book of mine closest to my own experience is Rough Cider, written over thirty years ago in 1986. It has remained in print and is often mentioned by readers as a personal favourite, a non-series ‘one-off’ written in the first person as if by a university lecturer, who is persuaded or compelled to recall traumatic events from 1943 in rural England during World War II. Much of it drew on my own memories of being made homeless and moved from suburban London to a farm in the West Country. In 1944 my home was destroyed by a V-1 rocket, one of those pilotless planes that Hitler sent over from France. Miraculously, all my family survived while everyone in the other half of the semi-detached house was killed. My mother had gone shopping when the air-raid siren sounded. She had left two of her three sons in the house. I was at school nearby and our father was away in the army. Mother had told my brother John, who was 14, to make sure that if the warning came he took my younger brother, Andrew, who was 3, under the Morrison shelter—a cast-iron table that had been offered by the government to all houses within range of the rockets. The table held up under the weight of the rubble and the two boys were dug out alive. Being homeless, we slept for a few nights on the vicar’s living-room floor until arrangements were made to send us to a temporary home out of London. So my mother and her three sons took a long train journey to Cornwall in the West Country and were found accommodation on an isolated farm. The farmer and his wife and grown-up son had no choice but to accept this family from miles away. We were ‘billeted’—to use the terminology of the time. With hindsight I can understand how our hosts must have felt to have a woman in a state of shock and three noisy kids foisted on them at harvest time, but for us it was difficult to understand why we were not more welcome. The farmhouse was dark inside and lit by oil-lamps, and had curtains across all the doors to keep draughts to a minimum. As an 8-year-old, I found it spooky. Good thing I wasn’t without my family, as many so-called evacuees had found themselves earlier in the war when they were sent to the country for their own safety. Of course, the writer’s imagination moves on from remembered things to events that didn’t happen in reality. There was no suicide on the farm, no murder and no cider that I can recall. But the novel is centered around a plot involving an American soldier posted to England, and as a boy I did get to meet GIs at the local American Army base. After our return to London, we Lovesey boys were invited to a party put on specially by the GIs for ‘bombed-out’ kids—and it was wonderful. I can still remember the silent films they projected onto a screen for us—Buster Keaton and Chaplin—and the magician, and the food! Food we didn’t know existed. I was one of the first British children to taste a Hershey Bar and chewing gum. No wonder I can understand how the boy Theo came to idolize the soldier called Duke. So there it is. I mustn’t give away more of the plot. Rough Cider remains a personal favorite for reasons you will now understand. Peter Lovesey has been a crime writer since 1970. He was guest of honor at this year’s CrimeFest and will receive a Lifetime Achievement Award at the 2019 Bouchercon in Dallas.